MARTIN, Tenn. – Bailey Barber, of Murfreesboro, returned to the University of Tennessee at Martin last fall after a summer full of bugs, snakes, birds, poison ivy and mosquito bites. But she wasn’t just having fun in the sun – she was also working an intensive internship through the Tennessee Parks Service. What started out as professor-required community service at Reelfoot Lake State Park evolved into a summer position at Mousetail Landing State Park in Linden through the Seasonal Interpretive Rangers Program. Barber, a senior studying natural resources management with a focus on parks administration, says her experience with the parks service ran the gamut from children’s games and family hikes to trail building. Barber’s programs also included making birdfeeders out of pinecones and other natural materials, leading salamander crawls and creek stomps, helping children create rubbings of leaves and animal tracks, and organizing volunteers for special events. When she wasn’t conducting educational programs, Barber was out working in the park with other rangers and student assistants to make sure visitors of all ages could enjoy all Mousetail Landing has to offer. Her responsibilities also included caring for the birds of prey featured in her Saturday demonstrations and planning a special Thursday class for adults with mental disabilities. Barber is on track to graduate in May and will return to her parks position this summer. The Seasonal Interpretive Rangers Program is often the first step to more permanent parks positions, and Barber is keeping her options open. As far as the specific job opportunities in the field, the possibilities are endless. “You can pretty much do anything with park maintenance or park ranger (training). … You can do a lot of different things with wildlife too, so you don’t have to have a wildlife degree to work in resource management or in captivity for birds and ducks and things like that. You can get jobs in all those fields with a parks degree, so there is a really broad range for what you can do,” she said. Barber encourages other students to not only consider internship opportunities, but to seek feedback from academic advisers and more experienced students. 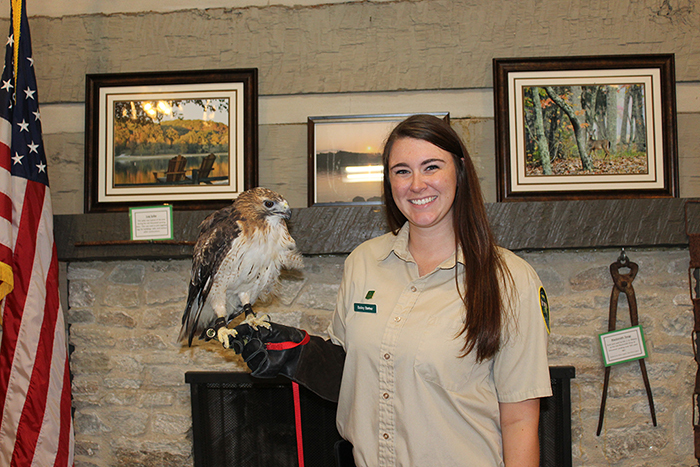 PHOTO ID: Bailey Barber, a UT Martin senior from Murfreesboro, is shown working with a red-tailed hawk during one of her special demonstrations as part of the Seasonal Interpretive Ranger program at Mousetail Landing State Park.